She worked with: Anthony Braxton, Muhal Richards Abrams, Dave Douglas, Kenny Wheeler, Jason Moran, Tim Berne, William Parker, Tom Rainey, Mary Halvorson, Kris Davis, Tyshawn Sorey, Craig Taborn, Luc Ex, Django Bates’ Human Chain, The Continuum Ensemble, Wet Ink and many others. Laubrock's main projects as a leader are Anti-House, Sleepthief, Ingrid Laubrock Septet and Ubatuba. 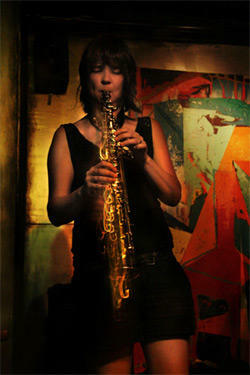 Collaborations include Paradoxical Frog, Ingrid Laubrock/Tom Rainey Duo and Crump/Smythe/Laubrock. She is a member of Anthony Braxton's Falling River Music Quartet, Nonet and 12+1tet, Tom Rainey Trio and Obbligato, Mary Halvorson Septet, Kris’ Davis Quintet, Nate Wooley’s Battle Pieces and Luc Ex’ Assemblée. She was one of the featured soloists in Anthony Braxton’s opera Trillium J. Awards include the BBC Jazz Award for Innovation in 2004, a Fellowship in Jazz Composition by the Arts Foundation in 2006, the 2009 SWR German Radio Jazz Prize, the 2014 German Record Critics Quarterly Award, Downbeat Annual Critics Poll Rising Star Soprano Saxophone (2015) , Rising Star Tenor Saxophone (2018) and Herb Alpert/Ragdale Prize in Composition 2019. Commissions include Jammy Dodgers for Jazz Quintet and dancers (Covent Garden Opera 2006), Nonet Music for Cheltenham Jazz Festival 2007, Octet for SWR New Jazz Meeting 2011, Echo for SZOctet (A L'Arme Festival 2015) and chamber orchestra pieces Vogelfrei (ACO/Tricentric Foundation 2014) and Contemporary Chaos Practices (moers festival 2017) and Chants II (Wet Ink 2018). Laubrock was Improviser in Residence 2012 in the German city Moers. The post is created to introduce creative music into the city throughout the year. As part of this she led a regular improvisation ensemble and taught sound workshops in elementary schools.